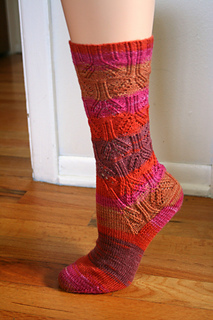 These socks are knit from the top down using a construction created by Cat Bordhi. She calls this construction the “Sky” construction in her book, New Pathways for Sock Knitters. For more on this construction, please see her book. She has some baby socks in the book using this construction for a quick knit to learn more about it. 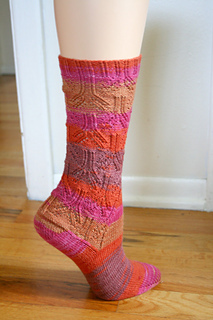 In this sock pattern, the patterning is on the leg and down what would traditionally be the heel flap. The arch of the foot expands as you are knitting the part of the leg that would normally be the heel flap. So, you work the gusset before you work the heel, then work the heel and make decreases on the bottom of the foot to get to the right number of foot stitches. 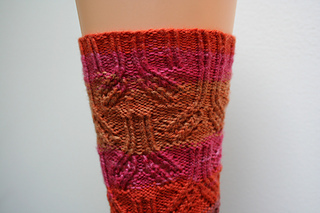 If you have ever knit a toe-up sock with gussets, this construction is very similar, except you work the cuff where the toe would be and the toe where the cuff would be! toe-up sock (the way the heel/gusset area is worked) and combines it with what I love about top down socks (No need to worry about a stretchy bind off, and a simple toe).